Last month, I reviewed the first book in the Journey of the Heart series, A Heart's Disguise. I enjoyed that short title, and looked forward to the next installment. 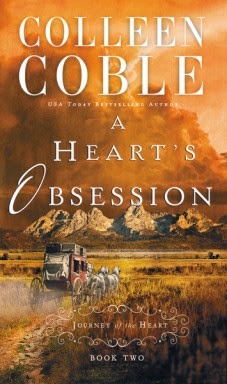 Today, I'm here to tell you a bit about A Heart's Obsession, which is book two in this series by Colleen Coble. Much like Book One, this is an incredibly quick read. In this book, Sarah's father has died, which didn't bother me as much as I expected it to. I commented in the last review on how I don't particularly like any of the characters. Book Two doesn't change that a lot, but I am starting to warm up to a couple of them. I love reading about the post-Civil War time period, and I do like it even more now that the action is taking place out west (Wyoming). I am looking forward to reading A Heart's Danger, which is book three in this series, and you can be looking for a review of that in May. Meanwhile, there is a giveaway and Facebook party coming up! Can a woman held captive by her family make it back to the one man she knows she can trust? Find out in book two, A Heart’s Obsession, of Colleen Coble’s Journey of the Heart series. When Sarah Montgomery’s father succumbs to his long illness, Sarah is faced with a life-altering choice: submit to her brother’s will and marry the deceptive Ben Croftner . . . or escape through the dangerous American West to reclaim the heart of her beloved Rand Campbell at Fort Laramie, Wyoming. Celebrate book two in Colleen’s A Journey of the Heart series by entering to win a Kindle Fire and RSVPing to her May 5th author chat party!